AGGLUTINATE - To clump together, as with antibodies and antigen during blood testing. ANTIBODIES - A protein carried in the blood; produced in response to exposure to bacteria, such as pullorum-typhoid. ANTIGEN (in blood testing) - A solution made from pullorum-typhoid bacteria that have been chemically killed and suspended in a salt solution; used to detect the presence of antibodies in the blood. APHIS - Animal and Plant Health Inspection Service, a division of the U.S. Department of Agriculture. AUTHORIZED TESTING AGENT - Any person designated to collect official samples for submission to an authorized laboratory and to use stained antigen to perform the rapid whole blood test for pullorumtyphoid. AVIAN INFLUENZA (AI) - A viral respiratory disease in birds that can spread easily among both domesticated and wild birds. The National Poultry Improvement Plan monitors this disease. See the Additional Resources for more information about avian influenza. AVIC (Area Veterinarian in Charge) - A designation is given by the USDA Animal and Plant Health Inspection Service. Bacillary white diarrhea - Original name used for pullorum-typhoid disease. Biosecurity - Any precautionary action or set of actions taken to prevent the spread of disease. Examples include wearing designated clothing, cleaning, disinfecting, controlling rodents, and minimizing contact with wild birds. Bleeding needle - A tool used to puncture the wing vein of the bird for the collection of a blood sample. BOAH - Indiana State Board of Animal Health. Breeding stock - The offspring of a specific breeding combination within a species of poultry. Code of Federal Regulations (CFR) - A publication containing all of the rules and requirements of the executive departments and agencies of the federal government. The CFR is divided into 50 titles that represent broad areas subject to federal regulation. Each volume of the CFR is updated once each calendar year and is issued on a quarterly basis. County Fair Poultry Exhibitor Form - The form filled out by an NPIP authorized agent, or a certified blood tester, as an alternative to USDA form VS 9-2. It is used to certify that all poultry shown at a county fair came from NPIP-certified Pullorum-Typhoid Clean flocks or were tested for pullorumtyphoid disease within 90 days of the show date. The form can be easily reproduced by poultry superintendents. Dealer - An individual or business that deals commercially in hatching eggs, newly hatched poultry, and started poultry obtained from breeding flocks and hatcheries. This does not include an individual or business that deals commercially in buying or selling poultry for slaughter only. Direct contact - Close proximity of birds through contact with other birds or infected manure. Examples include visiting other farms and exhibition shows. Disease - An abnormal condition in the health of an animal that is caused by infection, basic weaknesses, or environmental stress. Disinfectant - Any chemical agent used to destroy or inhibit the growth of harmful organisms. Exhibition - Poultry Domesticated fowl that are bred for the combined purposes of meat or egg production and competitive showing. Exotic Newcastle disease (END) - A contagious and fatal viral disease that affects all bird species. It is so deadly that many birds die without showing any signs of disease. Exposed (Exposure) - Contact with birds, equipment, personnel, supplies, or any article infected with or contaminated by communicable poultry disease organisms. Flock - (1) As applied to breeding: All poultry of one kind of mating (breed and variety or combination of stocks) and of one classification on one farm; (2) As applied to disease control: (a) all of the poultry on one farm, or (b) any group of poultry that is segregated from another group and has been so segregated for a period of at least 21 days may, at the discretion of the Official State Agency, be considered as a separate flock. Flock Selecting & Testing Report - Also referred to as VS Form 9-2. This is a USDA form that is filled out by an NPIP authorized agent, or a certified blood tester. Poultry exhibitors use this form to certify that all their poultry to be shown at a public exhibition were tested for pullorum-typhoid disease within 90 days of the show date. It includes copies for the Indiana State Poultry Association, the blood tester (if different than owner), and the flock owner within one pad. Game birds - Domesticated fowl such as pheasant, partridge, quail, grouse, and guinea fowl, but not doves and pigeons. Hatchery - A facility specifically designed to hatch eggs. Health - Overall condition of an animal at a given time. HPAI Highly pathogenic avian influenza - A very infectious and fatal form of avian influenza that, once established, can spread rapidly from bird to bird or flock to flock. It typically causes severe illness with high death losses. Indiana County Fair Poultry Superintendent Report - The form filled out by the poultry superintendent and sent to the Indiana State Poultry Association. It certifies that all poultry shown at the county fair came from an NPIP-certified Pullorum-Typhoid Clean flock or were pullorum-typhoid tested within 90 days. Indirect contact - Close proximity with birds or bird owners through contact with the equipment, people, or environments that had direct contact with other birds. Examples include visits to feed stores and other places where flock owners frequently visit or using equipment that has been used with other birds or flocks. Infected flock - A flock in which an authorized laboratory has discovered one or more birds infected with a communicable poultry disease for which a program has been established under the NPIP. Infectious diseases - Diseases caused by viruses, bacteria, and fungi. ISPA - Indiana State Poultry Association. LPAI (H5/H7) Low pathogenicity avian influenza - An infection of poultry caused by an influenza A virus of H5 or H7 subtype that can mutate into high pathogenicity avian influenza (HPAI). Poultry will be considered to be infected with H5/H7 LPAI if: H5/H7 LPAI virus has been isolated and identified as such from poultry, viral antigen or viral RNA specific to the H5 or H7 subtype of avian influenza virus has been detected in poultry, or antibodies to the H5 or H7 subtype of the avian influenza virus that are not a consequence of vaccination have been detected in poultry. Microagglutination test - A standard test performed by an authorized laboratory to detect diseases monitored by the National Poultry Improvement Plan. Mycoplasma gallisepticum (MG) - A bacterial infection in poultry characterized by respiratory symptoms and lesions. The National Poultry Improvement Plan monitors this disease. Mycoplasma meleagridis - An egg-transmitted bacterial infection of turkeys that is often not apparent in breeder turkeys. The National Poultry Improvement Plan monitors this disease. Mycoplasma synoviae (MS) - A bacterial infection in poultry that is characterized by inflammation of membranes near the joints and tendon sheaths. The National Poultry Improvement Plan monitors this disease. National Plan Dealer - A participating dealer in the National Poultry Improvement Plan. National Plan Hatchery - A participating hatchery in the National Poultry Improvement Plan. NPIP National Poultry Improvement Plan - A joint effort between the poultry industry, and state and federal organizations that is responsible for certifying that U.S. poultry and poultry products for interstate and international distribution are free of diseases. Official State Agency (OSA) - The state organization recognized by the U.S. Department of Agriculture to cooperate in the administration of the NPIP. Parasitic diseases - Diseases caused by protozoa, worms, and external parasites such as mites and lice. Participating flock - Flocks that have met the requirements of the National Poultry Improvement Plan to the satisfaction of the designated official state agency. Perimeter control - A biosecurity practice establishing a designated fenced-in area used to isolate birds from unintentional contact with people or other birds. Poultry - Domesticated fowl, including chickens, turkeys, ostriches, emus, rheas, cassowaries, waterfowl, and game birds, except doves and pigeons, that are bred for the primary purpose of producing eggs or meat. Public Exhibition - A public show of poultry. Pullorum disease - A disease of poultry caused by Salmonella pullorum bacteria. This disease and typhoid disease, which is caused by Salmonella gallinarum bacteria, are commonly identified together as pullorum-typhoid disease. The National Poultry Improvement Plan monitors this disease. Pullorum-typhoid disease (PT) - A common reference to poultry diseases caused by Salmonella pullorum bacteria (pullorum) and Salmonella gallinarum bacteria (typhoid). The National Poultry Improvement Plan monitors this disease. Quarantine - A strict isolation imposed to prevent the spread of disease. 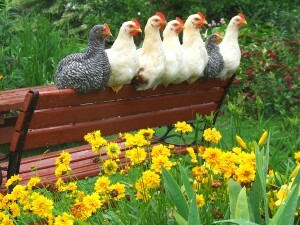 For poultry, it is recommended to isolate newly acquired or arriving birds from existing flocks for at least 21 days. Rapid serum plate test A standard test performed by an authorized laboratory to detect diseases monitored by the National Poultry Improvement Plan. Reactor A bird that has a positive reaction to a test for any poultry disease for which a program has been established under the NPIP. Reservoir A place for infectious agents to persist in an area. Examples include other birds or organic matter providing life support for these agents. Salmonella - Any bacteria belonging to the genus Salmonella, including Salmonella pullorum and Salmonella gallinarum, which cause pullorum-typhoid disease. Salmonella enteritidis - A bacterial infection in poultry that primarily affects the digestive system. This disease is of major concern to the layer industry. The National Poultry Improvement Plan monitors this disease. Salmonella gallinarum - Causative agent of typhoid disease. An egg-transmitted bacterial infection in poultry affecting joints, internal organs, and the digestive tract. Typhoid disease is commonly grouped with pullorum disease (Salmonella pullorum) under the common name of pullorum-typhoid disease. The National Poultry Improvement Plan monitors this disease. Salmonella pullorum - Causative agent of pullorum disease. An egg-transmitted bacterial infection in poultry affecting joints, internal organs, and the digestive tract. Pullorum disease is commonly grouped with typhoid disease (Salmonella gallinarum) under the common name of pullorum-typhoid disease. The National Poultry Improvement Plan monitors this disease. Sanitize - To treat with a product that is registered by the U.S. Environmental Protection Agency as germicidal, fungicidal, pseudomonocidal, or tuberculocidal in accordance with the specifications for use as shown on the label of each product. The Official State Agency, with the concurrence of the USDA Animal and Plant Health Inspection Service, shall approve each product or procedure according to its specified usage. Serum - The clear, pale-yellow liquid that separates from the clot in the coagulation of blood. Standardized blood loop - A tool used to hold the blood that is collected with a bleeding needle during a blood test. The blood loop is used to mix the collected blood with the antigen on a testing plate. Testing plate - Glass slide used to hold mixed sample of antigen and blood for evaluation. Tube agglutination test - A standard test performed by an authorized laboratory to detect diseases monitored by the National Poultry Improvement Plan. Typhoid disease - A disease of poultry caused by Salmonella gallinarum bacteria. This disease and pullorum disease, which is caused by Salmonella pullorum bacteria, are commonly identified together as pullorum-typhoid disease. The National Poultry Improvement Plan monitors this disease. USDA - United States Department of Agriculture. Vectors - Agents such as wild animals, rodents, or insects that transmit disease. VS - Veterinary Services; a division of the USDA Animal and Plant Health Inspection Service. VS Form 9-2 - Also referred to as the Flock Selecting & Testing Report. This is a USDA form that is filled out by an NPIP authorized agent, or a certified blood tester. Poultry exhibitors use this form to certify that all their poultry to be shown at a public exhibition were tested for pullorum-typhoid disease within 90 days of the show date. It includes copies for the Indiana State Poultry Association, the blood tester (if different than owner), and the flock owner within one pad. Waterfowl - Domesticated fowl that normally swim, such as ducks and geese. Whole-blood plate test - A test performed by authorized testing agents to detect pullorum-typhoid disease.